Do I Pack My Own Parachute? Your parachute: it’s the thing that saves your life, the wing that glides you safely back to earth. For many people, if asked whether they want to pack their own parachute, the answer would be a resounding ‘heck no!’. And we get that, we do. There’s a lot of responsibility you’re taking on when you pack a parachute, whether it’s for you or someone else. You see, parachute packing is an incredibly important job. So it’s something we teach in great detail, making sure you know exactly what you’re doing and have given it plenty of practice before jumping your own pack. 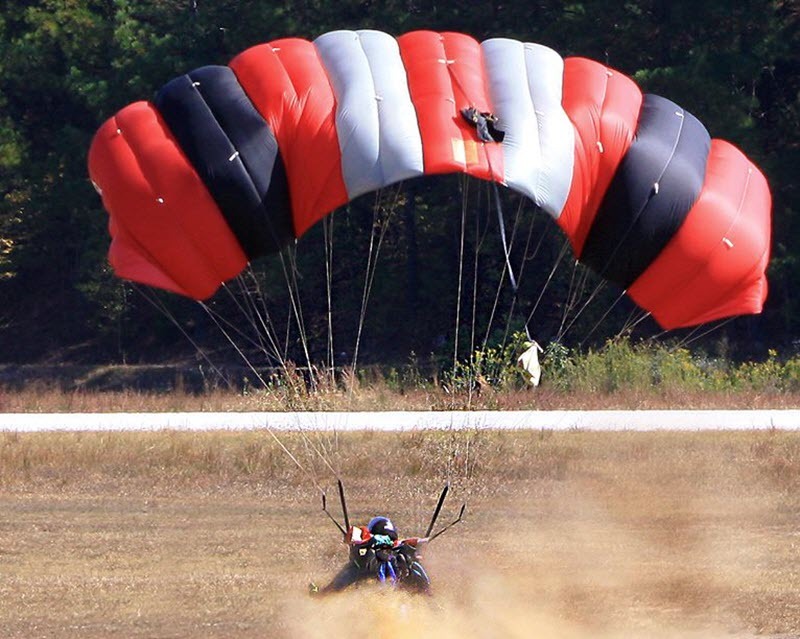 It’s perfectly possible that you could be packing your own parachute pretty early on in your skydiving career. Let’s look in more detail and what packing a parachute for skydiving involves and who might do it for you. What’s involved in parachute packing? The actual process of packing the parachute is essentially all about folding the material and the lines back into the container from which it came. Back in old school skydiving, with round parachutes, the packing process didn’t really have too much of an effect on how the parachute opened on deployment. As long as it was packed away and not tangled up, it was pretty much good to go. Today’s skydivers jump much more advanced parachutes, which are wing-shaped for optimal flight capabilities. That means the process of packing them is much more involved, and has a much bigger effect on the way it deploys. While the packer can’t be held entirely responsible for the way the parachute comes out of its bag (after all, deployment usually happens while you’re falling 120mph through the air! ), they can do things to give the chute the best chance possible of opening without issue. The method for packing these parachutes is called PRO packing – PRO standing for ‘proper ram-air orientation’. That refers to the ‘ram-air’ design of the parachute, which means the chute has openings all along the front edge into which air is ‘rammed’ during flight, giving it its rigidity. When we ‘PRO’ pack, we are putting the parachute in the container in the correct orientation to fill with air as soon as it is released. Stowing the lines of the parachute – the strings that connect it to you – is also really important, and we use elastic bands to hold the lines in place and reduce the chance of them being tangled on deployment. As you can probably tell, there’s quite a lot to it, so if you do want to pack your own parachute, you’ll need to complete a packing course and prove you can do it through practice. Who will pack my parachute? If you’re just starting out learning to skydive, or if you’re joining us for a tandem jump as a one-off, you won’t pack your own parachute. Instead, your instructor will pack their own, or they’ll use a member of our highly experienced and fully qualified parachute packing team. The ‘packers’, as they’re known, are super awesome people, many of whom jump themselves, who work really hard to keep us all up in the air all day long. Hobby jumpers can choose to pack their own parachutes, or pay the packers to do it for them. That choice will usually come down to time or their own desire to pack or not – often, people prefer to grab a drink and chill after their jump, so they’ll use a packer then. Skydiving is fun. Heck, it’s the most fun thing you can do, if you ask us! But it’s also important that we take things like equipment management and care seriously. That’s why we have all these processes in place, not just for packing parachutes, but for skydiving equipment care in general. That’s why we’d never recommend trying to teach yourself to pack, or learning from YouTube videos. If you want to learn how to pack a parachute for skydiving, come and see one of the staff here at the drop zone or contact us to speak to a member of the team and we’ll be happy to help.